Urban exploiters and adapters are often coalesced under a term of convenience as ‘urban tolerant’. This useful but simplistic characterisation masks a more nuanced interplay between and within assemblages of birds that are more or less well adapted to a range of urban habitats. I test the hypotheses that objectively-defined urban exploiter and suburban adapter assemblages within the broad urban tolerant grouping inMelbourne vary in their responses within the larger group to predictor variables, and that the most explanatory predictor variables vary between the two assemblages. A paired, partitioned analysis of exploiter and adapter preferences for points along the urban–rural gradient was undertaken to decompose the overall trend into diagnosable parts for each assemblage. In a similar way to that in which time since establishment has been found to be related to high urban densities of some bird species and biogeographic origin predictive of urban adaptation extent, habitat origins of members of bird assemblages influence the degree to which they become urban tolerant. 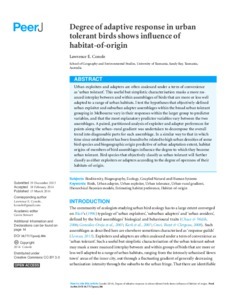 Bird species that objectively classify as urban tolerant will further classify as either exploiters or adapters according to the degree of openness of their habitats-of-origin.